You guys begged and pleaded so Seth and I delivered. 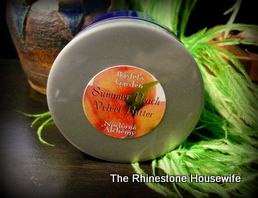 Nocturne Alchemy Velvet Butters are amazing…..very emollient and now available in a couple of lovely summer scents at The Rhinestone Housewife. These limited edition scents are only available until they’re gone so pick it up while you can! From the Nocturne Alchemy site: Ancient Egyptians believed in taking care of their skin, so we created a butter to honor the Ancients and for the supple care of our skin. 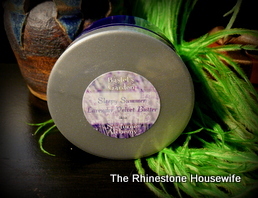 Each Velvet Butter is perfumed with Nocturne Alchemy Perfume Oil in a blue 4oz jar. These are limited for summer and once sold out will be no more. Summer Peach: A natural peach oil direct from peach skin and peach pit, created just for this summer in a soft sublime scent of freshly picked peaches right off the tree. Sleepy Summer Lavender: Imported French Lavender essential oil 40/42 steam distilled – permeates a very soft and beautiful scent on the skin. Each perfumed Velvet Butter is lightly scented and created not only to quench the skin and provide Vitamin E and natural nutrients, but also to invoke an Ancient time and purposeful time for the self to reflect or simply wrap yourself up in a beautiful, complimenting scent. A drop of perfume on top of the butter (once butter is softly absorbed into the skin), and inhale (recommended in Bastet’s Garden Egyptian Peach Blossom and Lavender Santalum). Perfect for dry skin and wonderful through the summer months. Velvet Butter Ingredients: Cacao Seeed Butter, 2x Shea Butter, Camellia Sinensis (Japanese Green Tea)Leaf Extract, Ascorbic Acid (Vitamin C), Tocopherol (Vitamin E), De-Ionized Aque, Veg. Stearic Acid, Veg. Caprylic Tryglyceride, Veg. Glycerol Stearate, Allantoin of Comfrey, Disodium EDTA and NA Perfume. can i review one of them? Sure, lots of people review purchases….completely up to you!